After a safety briefing you are led along the slippery Rocks, helping out your fellow Team-mates through a series of Team Games to keep you warm and get you used to the Coastal Environment, and basically to show you that there is no danger, and much fun to be had. 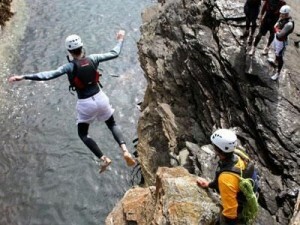 The Session will also include some Rock Scrambling, Rock Traversing, Rock Hopping, Swimming into Caves, Wallowing, Smiling, Laughing, and more Laughing! There is no pressure to do any high jumps or to do anything you do not feel comfortable with.